Lighting is one of the primary means of making a place feel safe and inviting and facilitating its use beyond daylight hours. It can be used to elevate and enhance the quality and character of space by providing attractive architectural or artistic design form during the daytime, and a variety of ambiance levels during the night time. This allows the campus to have various types of unique open spaces. Campus streets and open spaces should be well-lit to create a sense of safety and security, especially in winter, when daylight hours are short. 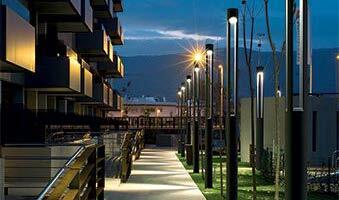 Lighting design should provide adequate illumination while minimizing light pollution. Dark sky lighting standards should be used to be in keeping with achieving a sustainable design approach. Energy-efficient lights should be installed throughout the Campus to minimize energy usage. The lighting design of open spaces should be carefully chosen to complement the use and character of the space and to enhance the unique elements and landscapes within. Pedestrian scale lighting should be used within the open spaces and streets. Vehicular scaled lighting should be used primarily at street intersections. The choice and style of light fixtures should contribute to building campus identity and creating a quality environment. The fixtures should complement the architecture and landscape and read as part of an overall package of furnishings for the Campus. Lighting can be in the form of art, and can be integrated into art forms as well. The design for the open spaces should include electrical conduits for temporary or decorative lighting installations during festivals and events. Decorative lighting should not be used on trees. If trees are to be illuminated, lighting should be provided at the ground level or adjacent to the trees in the form of a bollard.